I've been open about pursuing a few of my dreams here on the blog, so I thought it might be interesting to share some fears I've had about doing them. It feels incredibly exposed to even admit you have a dream. It's like opening your soul to let the world see that you want something. It feels a little like setting a feather on the end of your open fingers and hoping it'll stay there in high wind. But the other option is even less desirable ~ never even attempting to follow your dream. Holding onto that hope and hiding it away like a hoarder. What if this doesn't work? Will I look like a fool? What if it goes nowhere? These are just a few of the thoughts making any pursuit terrifying. I often remind myself: anything worth doing is worth the risk! 3. A lot of work. This is a no-brainer, but sometimes the amount of work can be totally underestimated. I definitely underestimated a good portion of opening an online shop. I've struggled with lots of bumps in the road of what looked like an effortless plan. But I know in the end, all that hard work will be worth it! 4. Not how you expected. This is most certainly a definite. Sometimes our dreams take different shapes at different times. Or maybe what started as one thing will morph into something completely different. Mine have morphed several times now. 5. Exactly what you want. As silly as it sounds, this can be the most frightening thought of all. I read somewhere that the fear of success keeps many people from taking a first step. Funny how our minds work, isn't it? But I totally get it. I've had moments of sheer panic when I thought, "What if this actually works?" Sounds funny because, of course I want it to work! But I think it's the responsibility following it that makes that thought scary. 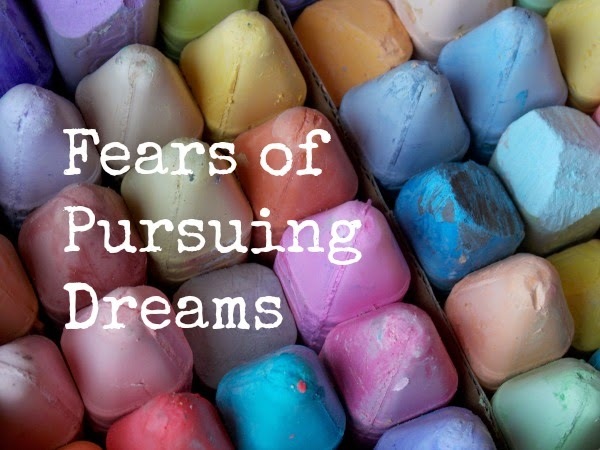 Do you have fears about pursuing a dream?